Having successfully staged the “Rent the Musical” show last February 2010, 9 Works Theatrical, together with Power Plant Cinema, is bringing back the award-winning Broadway Musical RENT to Manila. With a new but smaller stage, blocking, staging, and choreography are still great. Though there’s a little problem with the sound system. Gian Magdangal performance as Roger Davis was outstanding! Once again, he truly captured the emotional hurdles Roger faces within the year. He’s charm on stage is amazing and he just keeps getting better and better! Another pair who lit up the stage were Tom Collins (played by OJ Mariano) and Angel (Job Bautista). Once again these roles, and the relationship between them, were very complex and emotionally demanding. I really love their chemistry. Their scenes will really tug at your heartstrings. Another performer to watch out for is Mian Dimacali. Played as Maureen Johnson, Mian was awesome and provided an excellently mature performance. She truly captured the audience with her energetic and entertaining performance. In addition, Joanne (played by Jenny Villegas) was excellently portrayed. I really love Joanne and Maureen’s confrontation scene where they are singing Take Me or Leave Me. Jenny Villegas and Mian Dimacali complimented one another very well. No doubt Lorenz Martinez can really sing and act (I saw his performance in Wedding Singer), but his role as Benny is quite forgettable. Sab Jose (Alexi Darling) and Peachy Atilano (Mark’s Mom) are so cute! I love their energy on stage! Overall, the new cast is likable, the old cast is still exceptional and the show is still very touching. I would watch it again and again and again! This play covers it all: drama, laughter, sadness, illness, celebration and love. 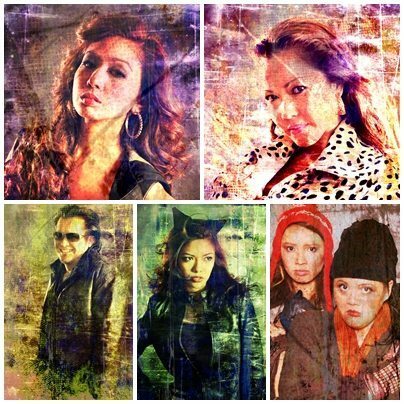 The artistic team of RENT is led by Robbie Guevara, director; Ricky Villante, musical director – band; Onyl Torres, musical director – vocals; Mio Infante, scenographer; Martin Esteva, Lighting Designer; Chuck Ledesma, sound designer; Bek Soriano, costume stylist; and Francis Matheu for additional choreography. 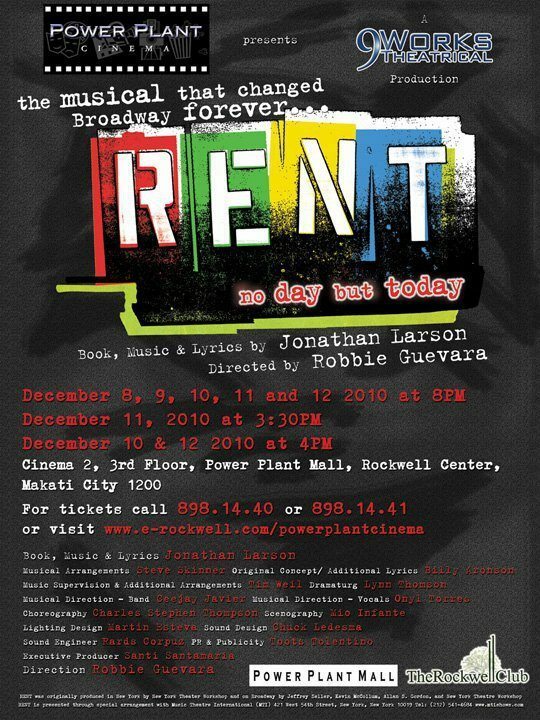 In celebration of Power Plant Cinema’s 10th Anniversary, RENT – a Pulitzer Prize and Tony Award winning revolutionary rock musical will be presented for a limited run at Cinema 2 from December 8 -12, 2010. Produced by Power Plant Cinema and 9 Works Theatrical, RENT will be directed by Robbie Guevara. 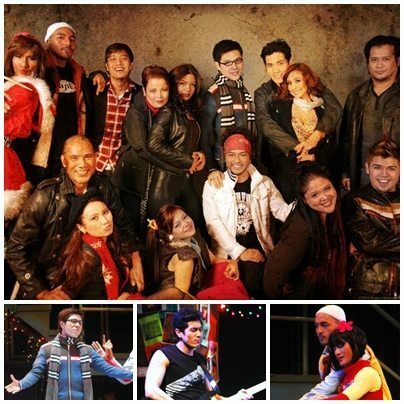 RENT will be staged for a limited run of 8 performances at Power Plant Cinema 2 from December 8, 9, 10, 11, 12 (8PM), December 10 (330PM), 11 (4PM) & 12 (430PM). Get your tickets now at the Power Plant Cinema ticket booth. Call 898-1440 or 898 1441 or 0908-8692988.